Have you ever felt bad that you didn’t have a fireplace mantel to decorate? The hearth is often viewed as the center of the home, a place of warmth around which to gather. 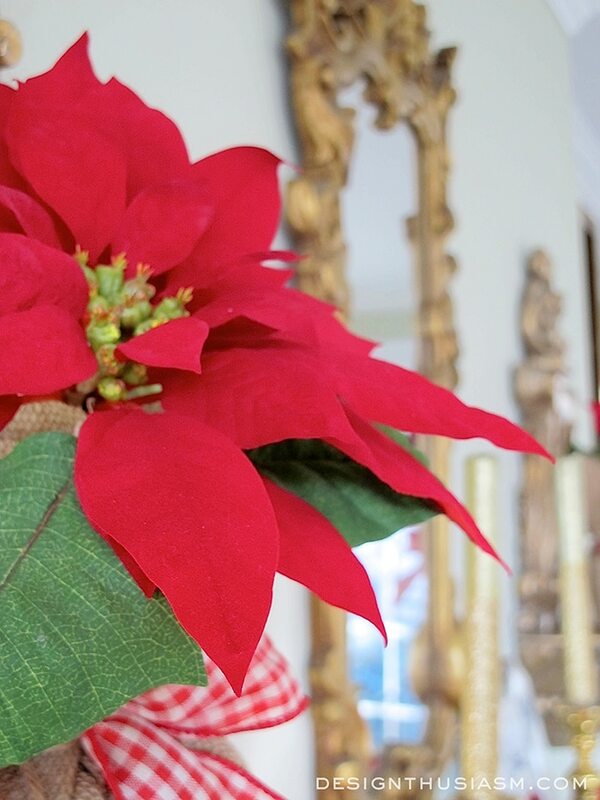 The mantel is the spot we focus much of our holiday decor, and the fireside an area we’re drawn to for food and drink. 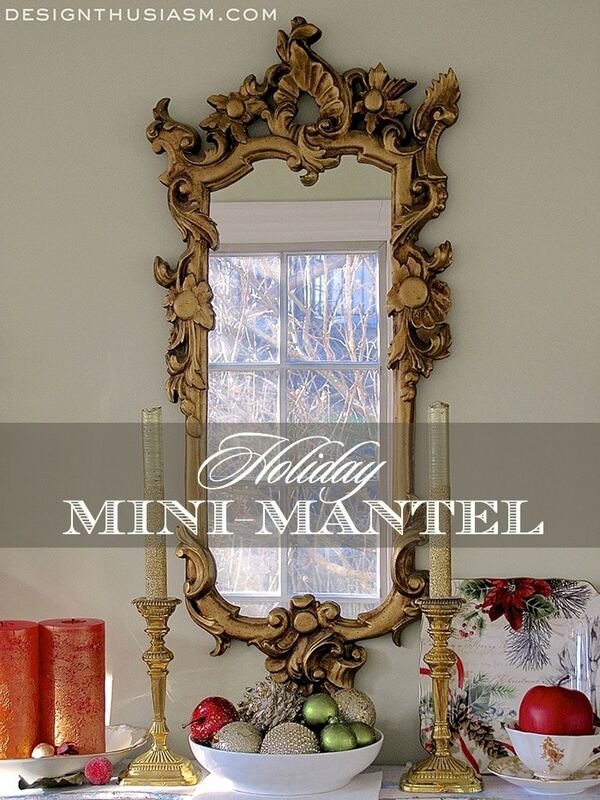 If you’re lacking a mantel and wishing you had one, this holiday mini mantel may be just the solution for you. All you really need to fake a mantel is a great shelf to decorate around. This ‘shabby chic’ example was found at a local antique market and I loved the many layers of chippy paint and curved edges. I just hung it on 2 hooks and had an instant mini mantel. Once you have the shelf you can decorate just like you would any fireplace mantel. For this holiday theme, I started with a lovely Christmas plate from Home Goods and let that drive my visual story. 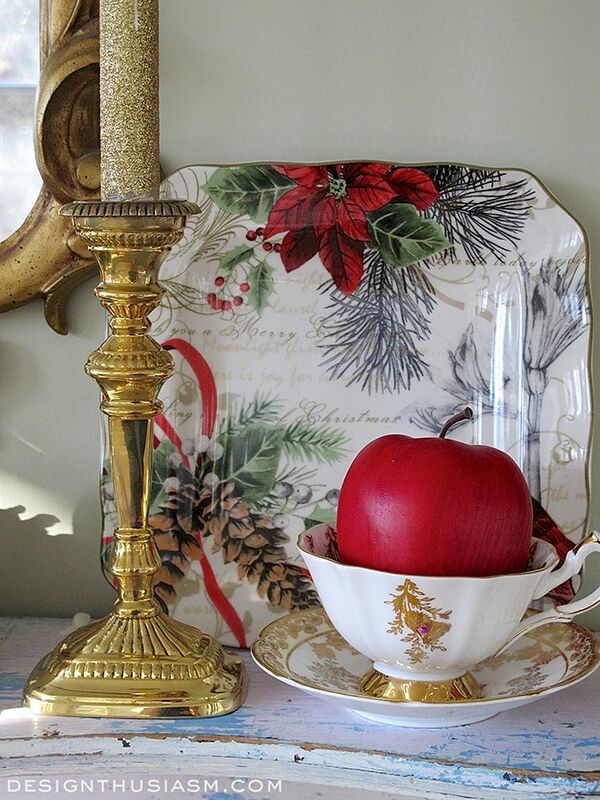 Propped against the wall, it’s held in place by a gilded china tea cup, weighted down by a lush red apple. 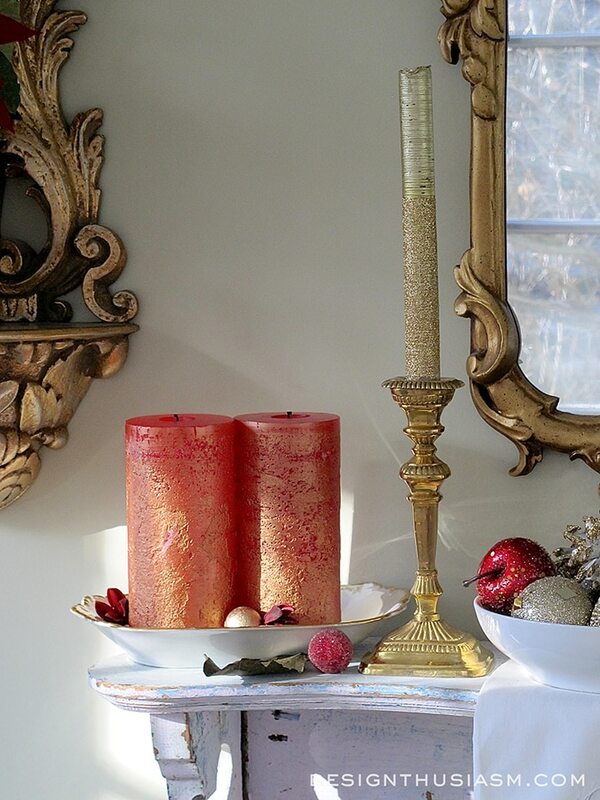 These wonderful pillar candles are red dusted with gold and are set upon a tiny vintage Limoges platter. 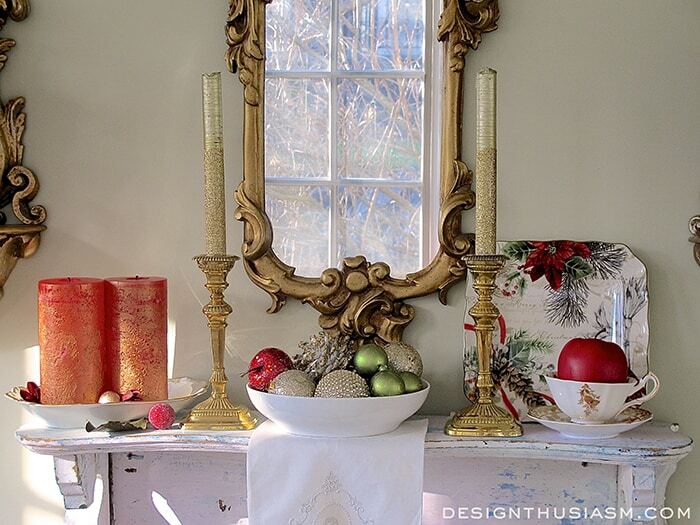 Bits of seasonal potpourri add a festive touch. 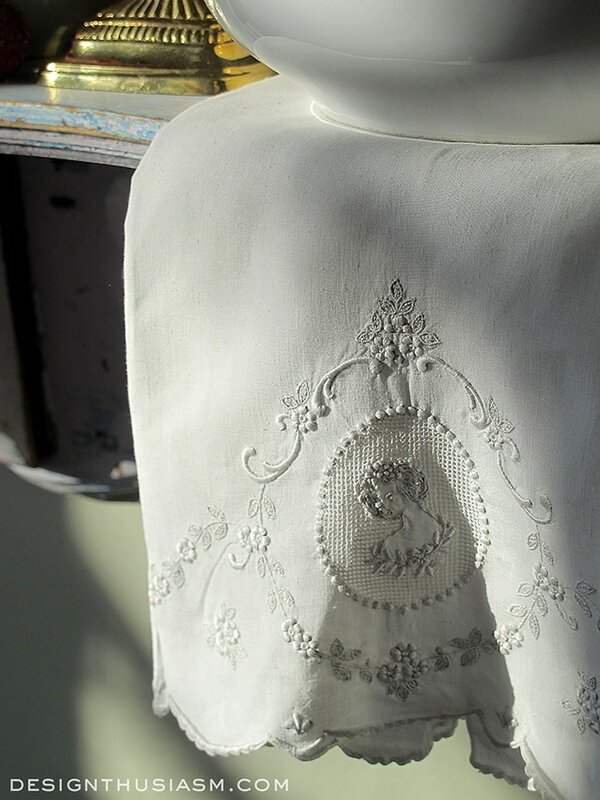 I’m a huge fan of vintage linens, particularly those that are tonal embroidered and this lovely delicate example fits in almost any vignette. 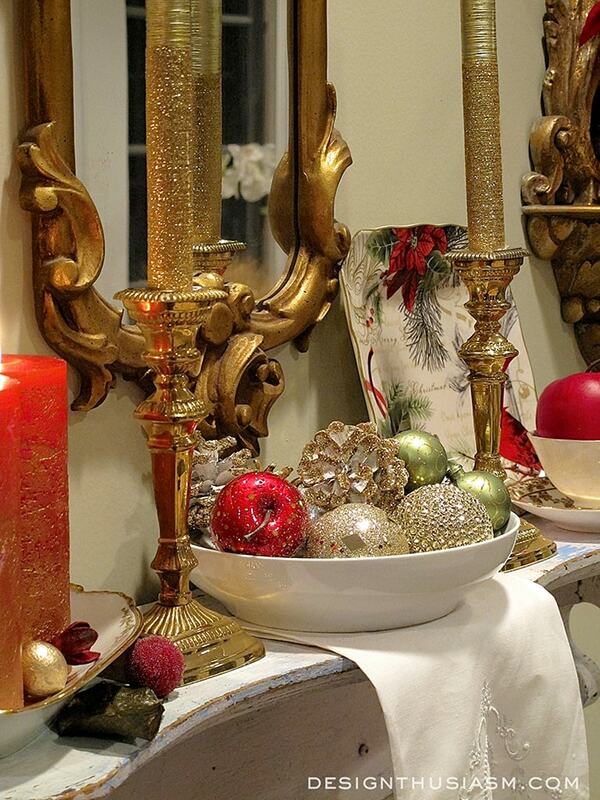 The most fitting topper for a variety of mantels is a gorgeous gilded mirror. Given the scale of my mini shelf, I went with a small but beautiful option with a very French feel to it. 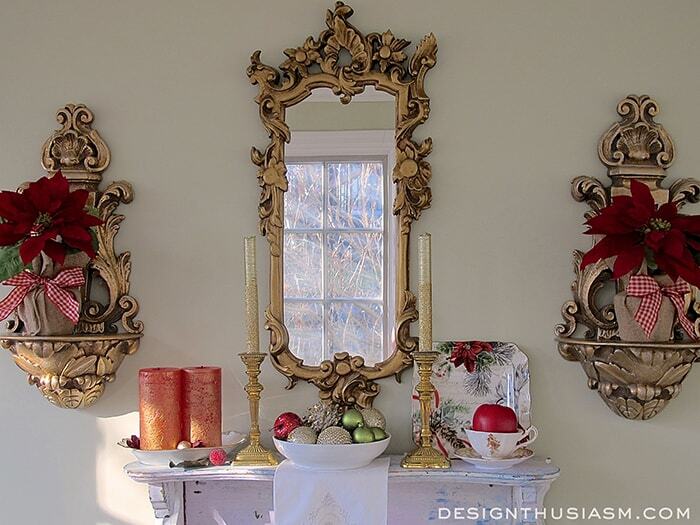 And just to beef up the scene and add a bit more interest, I added two gilded sconce-type shelves flanking the mirror. 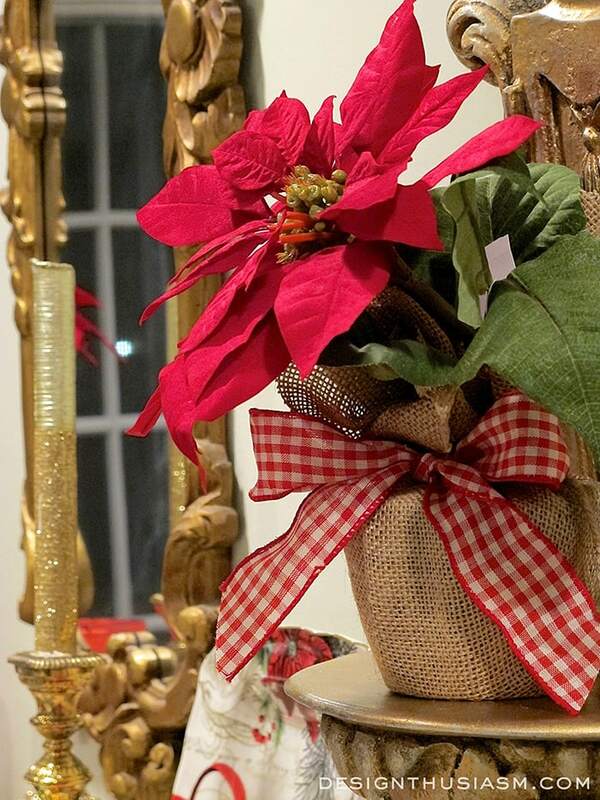 These little faux poinsettias are from Pottery Barn and I just dressed them up with red checked ribbon. 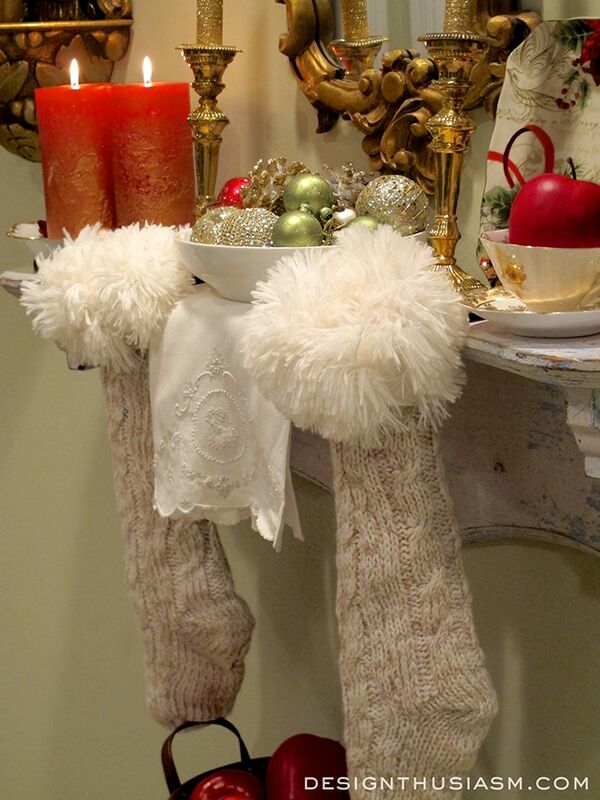 You can even add stockings to your mini mantel to complete the look. No need to feel you’re missing out without a fireplace to hang them. I always love a touch of glimmer in my decor to offset the rustic character of the vintage wood pieces. 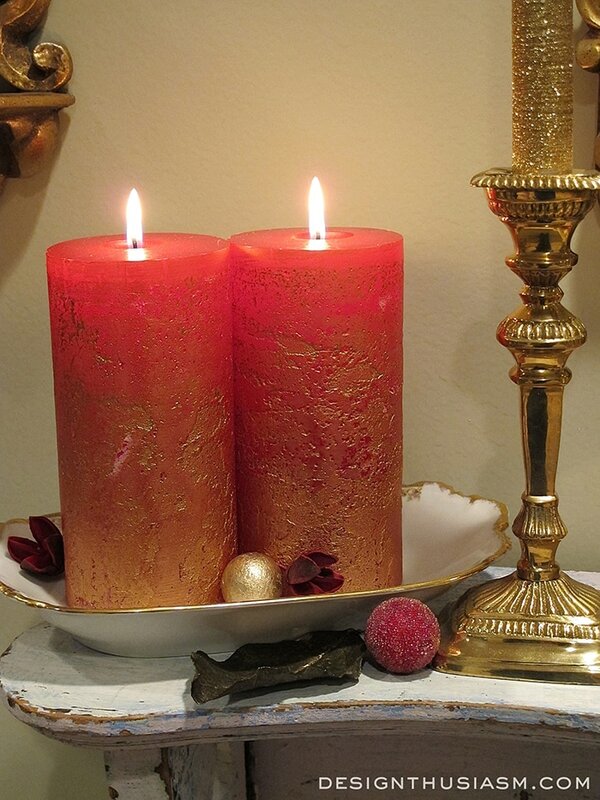 Here I have lovely brass candlesticks purchased from The Enchanted Home, paired with gold glittered candles. 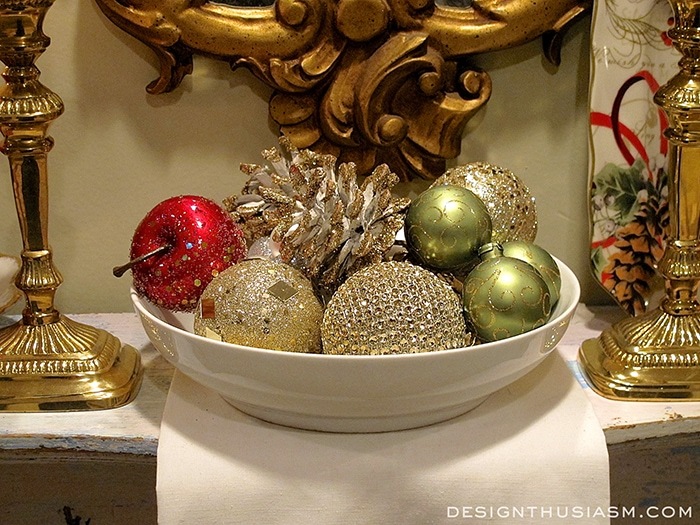 You can never miss with a bowl full of ornaments in holiday colors and these whitewashed pine cones have a little shimmer of their own. The vignette may be small but it makes a bold and joyous statement. Situated in my library, the shelf is set between my bookcases. It actually backs up against my real fireplace on the other side of the wall, and it feels like it belongs exactly where it is. 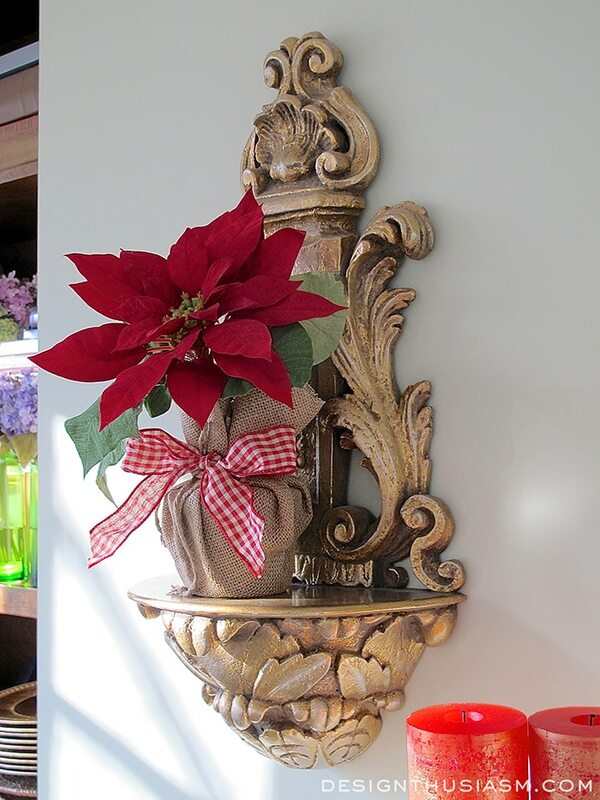 As we count down the final days of the holiday season, even this tiny corner of the house got a cheerful makeover. Wishing you and yours the most wonderful of holidays!! I absolutely love this! Everything about it is beautiful and lush! I do have one question though: Can you post a picture of the wall itself? Down to the floor? I’d just curious to see how it looks from a real full on angle? Do you have anything underneath it? Pretty please??? Thanks so much, Victoria! Not sure I can figure out how to post a separate pic here, but I can email you one. For anyone else wondering, I have a tiny chippy bench on the floor beneath with a grouping of coffee table books on top of it. When I decorated the mantle, I put a bucket of faux apples on top of the books, which you can see the top of in one of the pics in the post. Most of the year, the shelf has some faux lilacs in green bottles in the center, on top of the white vintage linen hand towel. On the sides I keep 2 vintage china pitchers with lilac florals painted on them (not matching, but co-ordinating). The two gilded shelves usually hold gold and white vintage tea cups. The section of wall is flanked by bookcases and the other three walls in the room are all windows.